The Pizza is always great but what's even better is the Awesome Staff. Cool zombie themed bar and the pizza is AWESOME!! Not a fan.......Tacky decor, rude barstaff, and WAY over priced drinks...I only went to this bar to support my friend who used to host karaoke there. Now that he doesn't host, I don't have to torture myself anymore. There was a story about a 'restaurant inside a restaurant' on Eater back in April that talked about Wicked Pizza operating inside Underworld independently. We will have to see if that remains after Bar Rescue or if there are changes made. The Underworld Bar and Grill/The End keeps an up to date Facebook page and has Karaoke on Sunday & Thursday as well as other themed nights. They also stated that the bar's name is "still legally underworld but we are getting it changed to The End"
Underworld/The End is having a viewing of the Walking Dead premiere and the viewing of their episode of Bar Rescue tonight (link). Here is a long blog post with a review and a lot of pictures of the food and the bar at The Underworld/The End. The reviewer went to the bar twice and gives glowing reviews such as: "This bar & grill is well managed and everything is done the old school high quality way." and " The service is polite and friendly. The food and drinks are reasonably priced. The interesting zombie theme signature cocktail creations are a real bargain, when compare to prices of signature cocktails around town." The Underworld website is down, but this may be due to the upcoming name change. 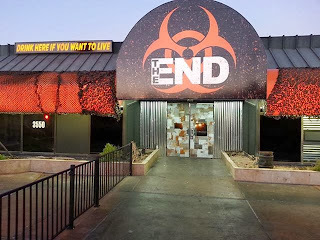 It sounds like the reviews for The Underworld/The End are mostly positive for both the food and the service, besides the guy who is probably just upset his friend isn't hosting karaoke anymore. It also sounds like the bar owners are going with what was recommended by Bar Rescue and they have been putting in the effort to turn the place around. UPDATE 3/2014 - The End has moved locations - More information on that here. UPDATE 2/2016 - The End has closed - More information on the bar closing. That was one of the better conceptual "rescues" I've seen from Taffer. I LOVED THE END BAR !! I live in Oklahoma City, Oklahoma and I gotta tell you, I wish we had a bar like THE END bar here!! AMAZING WORK !!!! Does the THE END bar have a website? I love how the show kept the owners personalities and interests in mind with the re-design. Even though there were a lot of changes, it was an easy transition from the old to the new. I'm not a fan of the show as I feel that in most cases Taffer turns every place he touches into the same cookie cutter variant of an already proven concept. I've seen him turn biker bars into a TGI Friday's knock-off and thus violating their customer core. I've seen him turn a local country bar into a wanna-be Vegas nightclub where the steady, working class/happy-hour customers were all but kicked out and replaced with Taffer's prized demographic (females 21-28). The new concept really works with The End. I've seen it as The Underworld and what made it cool (the horror concept) still works as the apocalyptic bomb shelter now called The End. Jon Taffer actually took a really cool concept and optimized it rather than replaced it with his own vision of "what works". He fixed the problems from the core (the management/help conflicts, placing systems that work with the bar, installing upgrades) rather then redesigned the concept altogether. It's all about bailing out bar owners and leaving them in a position where they can make money to pay off their debts. Their “core customers" were there when they got into trouble and "females 21-28" are what's needed to get them out. Are you a staffer of the show, Eric? Just curious. It seems like you have nothing but praise for the show and Taffer's tactic to create every indie bar into a wannabe Applebee's or TGIFridays. Las Vegas is a strange and unique market (no wonder there's been more Vegas based bars on the show than anywhere else). First, it's the ONLY market where bars are allowed to serve and operate 24/7/365. Now throw into the equation that per square mile, Vegas also has more opportunities to drink/play/gamble than anywhere in the country it makes for much stiffer competition. What draws in Vegas (especially with locals) is uniqueness and having an brand identity because lets face it, you can go anywhere there and get a beer. Anyway, what I was saying is that the problem wasn't necessarily the clientele (or lack thereof) with the bar when it came to Underworld/The End. It appeared as an identity and even more so, the friction between management and staff. Management needed to put in operational systems that increased efficiency which in turn, generate income. They needed to monitor certain employees to ensure that they weren't giving away more than they were bringing in. In this, I see the show's influence and it definitely helped. What my point about the prized demographic is that this doesn't necessarily work for every place without completely restructuring what the bar is and in this case, I don't think its necessarily right. I think that proclaimed "best brand ambassador" of the industry should be able to work with the original identity concept (ie: biker bar, local sports bar, small dance hall, etc) and make it better rather than completely rebrand the place into something that the owners, employees, and core customers can't even identify with. theres more vegas bars on the show because he lives in las vegas. obviously the bars on his shows are mostly because of being on the show rather than what he actual does to the venue (Aside from cleaning it). I don't understand. I can't like a show and comment on it unless I work for them? You make it sound as though proven concepts are bad things. Market informed proven concepts are what business is about. Anyone who operates under any other premise is a fool. Unfortunately, they've moved to a new address & only kept a handful of Taffer's changes. Bartender actually took breaks from making my drinks, both rounds so far, to grab beers & make shots for other patrons. Such a disappointment!!! The End came to an end. It is closed. Looks like The End is closed. The sign is no longer there. Looks like it's closes. The sign is removed. They were apparently moving locations, but if they are closed for good remains TBD. That was the prior location, same spot formerly The Underground. Bar Rescue 'rescued' it and it became The End. The sign is off the front and the place appears to be empty. No sign of life (imagine that). I live just a few blocks away. Don't bother. The place went belly up last year - December 2013. It's closed and all the signage is gone. That's the current location of the building. It's been shuttered since December 2013. All the signage is gone and the place is now a hangout for the homeless. The end of The End. It looks like they've been gone since just before December last year. I think the neighborhood killed them. It's asian-based and there wasn't a real demand for their brand of bar, especially in that shopping center. How come they keep posting on their Facebook page about specials and things at The End as recent as Jan. 7th? Their page may say one thing but as you can see by the photos at the link below, the signs and everything are gone from the building. 4821 S Decatur Blvd, Las Vegas, Nevada 89103 if you are local? Not asking you to go out of your way or anything... The old location is definitely closed and phone number disconnected. They moved to the building next door with a smaller sign. It is beside Dotty's. I pass it everyday, and go there once a week. People that live here need to open their eyes. They are beside the old building. If you see Dotty's then you will see the End sharing the same building. Quit saying they are closed when all you have to do is look and not be an @@@! Are you looking at the old location? Try looking beside Dotty's next door. Yes. We just noticed. It's in a smaller place next door to the old place. I think Taffer generally does a pretty good job of making each bar unique in their own way. You have to cater to the customers; obviously the "customer core" for most of these bars isn't worth catering to since they don't keep the business afloat. So of course there will be times when the bar concept changes drastically from what it originally was. Part of the reason why he ran with their concept is because it was a good concept. He can't help make a bar successful with a bad concept. There are plenty of bad concepts out there. Jon knows how to recognize a good concept as well as anyone. The End has moved next door to the original building in the retail 'storefront' spot directly next door to it. About 100ft. South on Decatur. The Spring Mtn. address given is the shopping complexe's main address. It's a TV show people. Lighten up. Random, but did anyone else see one of the female mystery diners at the bar in the beginning montage before the credits. It was the blonde that I think was called bride of chucky in an episode. I could be wrong but they look very similar. It did have a good concept, just badly executed. John just gave it a different twist and executed it well. I do not know why people are saying this Bar is closed??? It is up and running for business. I just went there recently with a close friend of mine, Had nothing but excellent Pizza, Cold Beers and outstanding Hospitality and Service from the Bar Tenders and Owner Kris. Went to The End once when visiting from Miami FL and got to meet the Owner Kris the first time, To find out he was from Miami FL made it a plus!!! We instantly clicked and talked about Miami and Bar Rescue. Now that I am a Vegas Local again I am planning to go back to The End with my Co-Workers and friends after work since it is only 10 minutes away from the Strip. The owners Proved that Taffer's Concepts and Bar Science works if they stick with it. The End is OPEN! I was there in the new location 3 weeks ago. It's facing Decatur, south of Spring Mountain. Many of the changes, including the post-apocalyptic Vegas sign, arms coming out of the wall, and murals are there. They actually had Bar Rescue on! The female bartender was brand new, and very nice. The manager said one of the owners had called and said Spike was going to run their episode, so he put it on. I'm in Vegas several times a year, and will make a point of returning next time. They really made us feel welcome.